With the primary aim of sharing aviation expertise, Guyana and Brazil have signed a Memorandum of Understanding. The MOU between the Guyana Civil Aviation Authority (GCAA) and the National Civil Aviation Agency of Brazil (ANAC) was signed by the GCAA’s Director General Lt. Col. (Ret’d) Egbert Field and ANAC Director-President Jose Ricardo Pataro Botelho De Queiroz. In addition to providing managerial, technical and operational cooperation in the field of civil aviation with each other, it is expected that the MOU will provide for the two civil aviation regulatory bodies to enhance their existing relationship. Based on the content of the MOU, the two sides will embrace knowledge exchange, technical cooperation, and best practice in developing, modernizing, operating and maintaining the civil aviation systems of both countries. Other areas of mutual interest will include the development of a State Safety Programme (SSP) and Safety Management Systems (SMS), safety surveillance and oversight, aircraft certification, personnel licensing, aerodromes, and airworthiness. The agreement also makes provisions for training of personnel, institutional strengthening, human resources management, regulation of air transport as well as economic regulation. 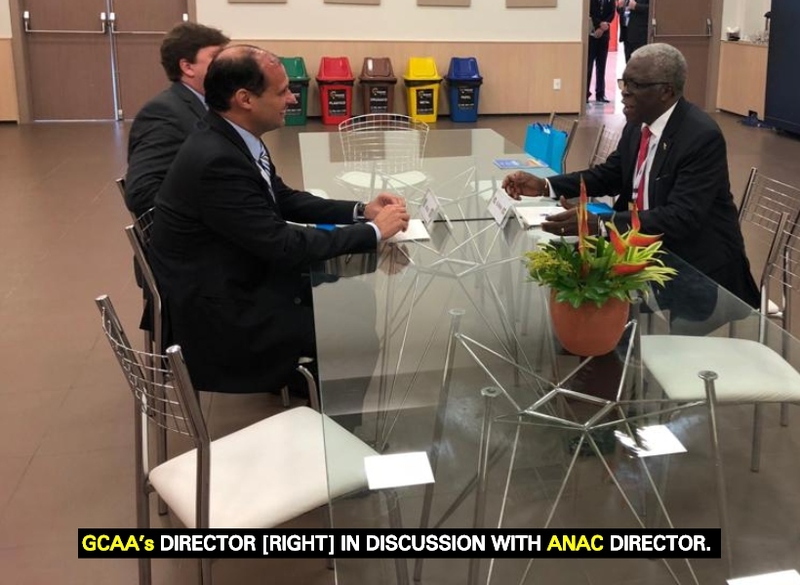 In this regard, Officers of the GCAA and ANAC will exchange their expertise in the various disciplines of civil aviation to provide training and/or technical visits either to Brazil or Guyana and develop studies to benefit both countries in the field of civil aviation. The MOU was signed on the side lines of the Fourth World Aviation Forum of the International Civil Aviation Organisation (IWAF/4) which was held in Fortaleza Brazil on September 17 – 19, 2018.